“For the first time ever, six former heads of Israel’s domestic secret service agency, the Shin Bet, share their insights and reflect publicly on their actions and decisions. Since the Six-Day War in 1967, Israel has been unable to transform its crushing military victory into a lasting peace. Throughout that entire period, these heads of the Shin Bet stood at the centre of Israel’s decision-making process in all matters pertaining to security. They worked closely with every Israeli prime minister, and their assessments and insights had – and continue to have – a profound impact on Israeli policy. Following that, at 23:20, BBC’s Two’s ‘Newsnight’ will be hosting a discussion on the topic with a group of as yet unidentified guests. As readers are no doubt aware, this is by no means a new topic for the BBC. The last few weeks of BBC reporting from the Gaza Strip have been characterised by a repeated pattern of much of that reporting taking place during humanitarian truces or ceasefires. One of the earliest and most striking examples of that pattern took place on July 20th in the Shuja’iya neighbourhood where, after hours of fierce fighting, Hamas requested that the ICRC broker a short ceasefire of several hours and after Israel agreed. The Western media – including the BBC – immediately moved in (with or without Hamas encouragement/facilitation) and the result was ample ‘disaster zone’ style reporting of destruction and casualties, but with details of the actual battle completely overlooked. In the weeks since then, no BBC report has properly described to audiences the battle which took place in Shuja’iya neighbourhood and no real effort has been made even to inform them of why a battle took place there. The latest 72-hour ceasefire is now also being used by the BBC to produce yet more of its ‘aftermath’ reports and one of those – presented by James Reynolds – was aired on BBC Two’s ‘Newsnight‘ on August 6th. In that report too, Reynolds passed up on the opportunity to properly inform BBC audiences why a battle took place in Shuja’iya. He does, however, continue the prevalent BBC practice of making over-dramatic, sweeping and simplistic characterisations of complicated situations. From the beginning Reynolds sets the scene by subjectively characterising Israel’s actions as an “offensive”. That of course eliminates from audience view all that came before: the fact that Israeli communities in southern Israel have been under attack for fourteen years, the hundreds of missiles launched by terrorists in the Gaza Strip at Israeli civilians between June 12th and the start of Operation Protective Edge on July 8th and the efforts made by Israel to avoid a military operation, which were rejected by Hamas. But the fact is that the Israeli army did not ‘believe’ that Shuja’iya was the site of tunnels and missile launchers – it knew that for certain. Over 140 missiles were fired from Shuja’iya alone in thirteen days before July 20th and the district was the site of the entrances to no fewer than ten cross-border tunnels. That, of course, is precisely why Israeli forces had to act there. Although he does admit the presence of terrorists in Shuja’iya neighbourhood, Reynolds makes no attempt to inform his audience of the scale of their operations and infrastructure there. He also neglects to tell viewers that the IDF advised the residents of Shuja’iya to evacuate four days before taking action there. He fails to clarify how that attempt to reduce Palestinian civilian casualties undoubtedly led to a higher Israeli death toll because – as veteran war reporter Ron Ben Yishai explains – that period of evacuation for civilians was used by terrorists to organise themselves ahead of the IDF’s entry into the district. Two other themes we have seen energetically promoted in BBC reporting from the Gaza Strip in recent days also make their way into Reynolds’ report. One of those is the theme that this round of hostilities has made Hamas more popular. The BBC of course has no factual, quantified evidence upon which to base that claim, but nevertheless it is being vigorously promoted by all its reporters on the ground, mostly by means of snapshot ‘man in the street’ interviews. The BBC, however, does not make any effort to inform audiences as to how free those people are to say what they really think on camera. Like the rest of his colleagues, Reynolds opts for inaccurate, context-free cheer-leading for Hamas’ demands but makes no effort whatsoever to clarify to viewers that the reason for the restrictions imposed by Israel (and Egypt) is terrorism and that “the ability to get things in from the outside world” crucially includes building materials for the construction of more cross-border attack tunnels and missiles from Iran. Reynolds’ caricature portrayals of border restrictions on the Gaza Strip and the fighting in Shuja’iya hence join an already long list of BBC reports which fail to meet the BBC’s obligations to “[e]nhance UK audiences’ awareness and understanding of international issues”. 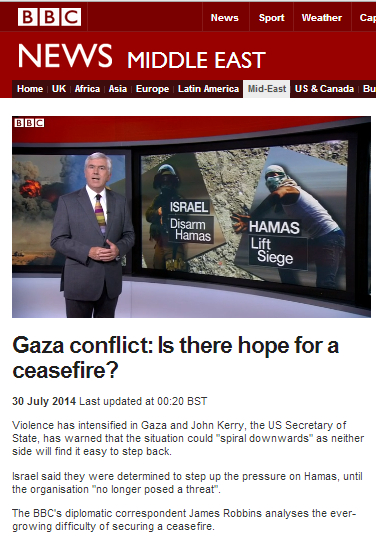 Why has the ‘impartial’ BBC adopted Hamas terminology? Over the past week or so, the BBC has put considerable effort into amplifying and promoting Hamas’ main pre-condition for a ceasefire: the removal of border restrictions imposed by Egypt and Israel in response to terrorism against their citizens carried out by terrorist organisations in the Gaza Strip. Documentation of some of those BBC efforts can be seen here, here, here and here. In the past few days, however, we have seen a shift in the BBC’s approach to the topic. No longer content with ‘merely’ providing context-free advertisement for the demands of a proscribed terror organisation, the BBC has now adopted that organisation’s terminology, ditching its former use of the phrase “economic blockade” for the inaccurate and partial term “siege”. Here is a screenshot from the July 28th edition of BBC Two’s flagship news and current affairs programme ‘Newsnight’. A besieging army does not ensure and facilitate the provision of humanitarian aid including food and medical supplies to those it surrounds. It does not supply them with 50% of their electricity supply, with oil and diesel or with cooking gas. It does not help them export their produce and give their farmers agricultural training. It does not evacuate their sick and treat them – sometimes at its own expense – in its own hospitals. Israel of course does all of the above – and more – and critically, Israel’s aim is not to compel “those inside to surrender”, but to prevent in as far as is possible the flow of weapons and dual-use goods which can be used to manufacture weapons into the Gaza Strip because for fourteen years its own civilians have been under attack by terrorist organisations located there. So why does Hamas insist upon inaccurately calling the border restrictions implemented by Israel and Egypt a “siege”? Firstly because it sounds much more dramatic for propaganda purposes and enables it to assume the role of the attacked. Secondly, any real and honest presentation of the situation should prompt observers to ask why those restrictions were implemented in the first place and that leads to the subject of Hamas terrorism, which does not line up with the current Hamas strategy of presenting itself to the world as the freedom-loving champion of impoverished, besieged Palestinian victims. Another example of this recent embrace of the language of that terrorist organization was seen on July 30th in yet another filmed backgrounder report produced by the BBC’s diplomatic correspondent James Robbins. The item was also promoted on the BBC News website’s Middle East page under the title “Gaza conflict: Is there hope for a ceasefire?“. There, Robbins distinguished himself by managing to present BBC audiences with an inaccuracy and/or a serious omission in almost every sentence of his report. What preceded those airstrikes – almost a month of incessant missile fire on Israeli civilian communities – is not communicated to BBC audiences. 15 July: Israel accepted the ceasefire initiated by Egypt and stopped all fire at 09:00. However, terrorists fired more than 50 rockets at Israeli communities. Only after six hours of continuous rocket attacks did the IDF respond. 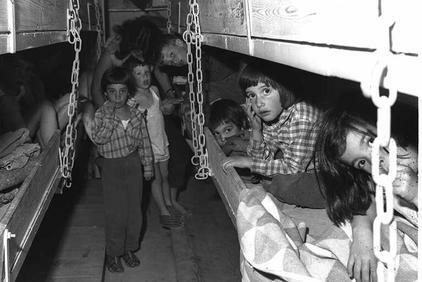 17 July: Israel agreed to a five-hour humanitarian ceasefire. 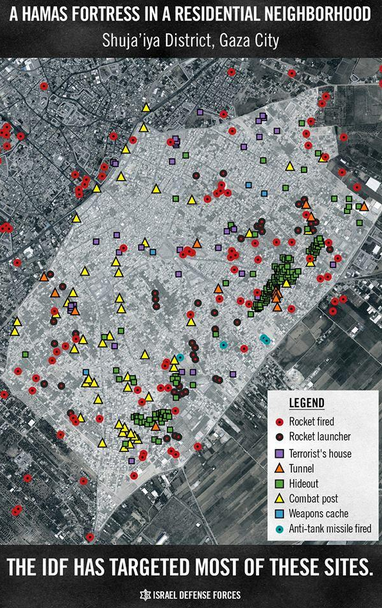 The terrorist organizations rejected it and fired rockets, including at the city of Be’er-Sheva. 20 July: Israel approved a two-hour medical/humanitarian window in the area of Shejaiya, following an International Committee of the Red Cross (ICRC) request. Forty minutes after the ceasefire began, Hamas violated it. Nevertheless, Israel implemented the ceasefire, even extending it for two more hours. 26-27 July: Israel respected an UN-requested humanitarian ceasefire from 08:00-20:00 on Saturday, 26 July. Israel announced its readiness to prolong the ceasefire until midnight, but a few minutes after 20:00, Hamas renewed firing rockets at Israeli civilians. On the same day (26 July), Hamas announced a 24-hour humanitarian ceasefire, at 14:00. Hamas violated its own ceasefire a short time later.Despite Hamas’ continuous fire, Israel decided to extend the humanitarian ceasefire a second time, from midnight Saturday to midnight Sunday. 28 July: Israel accepted Hamas’ request for a ceasefire in honor of the Muslim holiday of Eid al-Fitr. The IDF was instructed to cease military attacks, but Hamas continued to launch rockets at Israel. 30 July: Israel announced a temporary humanitarian ceasefire between 15:00-19:00. A few minutes after the ceasefire began Hamas fired rockets at the southern cities of Ashdod and Ashkelon, as well as other Israeli communities. Aha – that must be why the US has just approved a new transfer of military equipment to Israel. 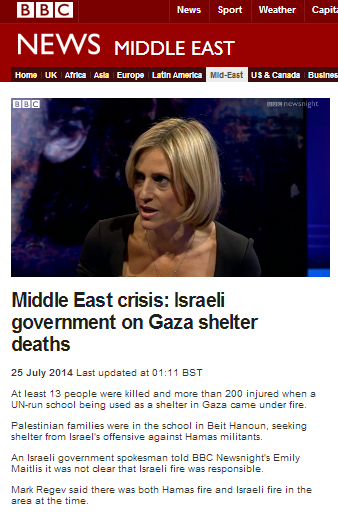 Robbins makes no effort to inform viewers of two very significant factors which contribute to the difference in the numbers of civilian casualties in Israel and Gaza: Israel’s extensive investment in civil defence, including the Iron Dome, and Hamas’ use of civilians in the Gaza Strip as human shields. Then, for the second time in six days, he misrepresents the aim of Israel’s operation in the Gaza Strip: a topic on which he goes on to inaccurately elaborate. Remarkably, Robbins fails to inform viewers of the rather critical fact that Hamas is an internationally proscribed terrorist organization. The disarming of Hamas was never declared an objective of this operation by Israeli leaders. Its often repeated aim is to enable the civilians of Israel to live their lives quietly and securely without missile fire from terrorist organisations in the Gaza Strip. The attempted cross-border tunnel infiltration by Hamas terrorists on the morning of July 17th made a ground operation to neutralize Hamas’ attack tunnels necessary. Whilst many politicians and members of the general public in Israel are of the opinion that Hamas should be disarmed and the Gaza Strip made into a demilitarized zone for the wellbeing of both Israeli and Palestinian civilians, it was never Israel’s declared (and unrealistic) aim to destroy every last missile in the Gaza Strip. Robbins continues, with use of Hamas terminology both in his narration and in the accompanying illustrative graphic. Once again, Robbins fails to inform BBC audiences what brought both Egypt and Israel to implement border restrictions, but of course it is rather difficult to explain Hamas terrorism if one has already avoided any mention of the fact that Hamas is a terrorist organization. Despite Robbins’ obviously deliberate attempt to mislead viewers, there are of course no restrictions on the entry of foodstuffs to the Gaza Strip; the only controlled items are dual-use goods which could be used for the purpose of terrorism. Notably, Robbins makes no attempt to explain to audiences the purpose of those tunnels and – like all BBC reporting in the past three weeks – fails to mention which regional actors have helped Hamas to arm itself and why the removal of border restrictions would make rearming – and further conflict – inevitable in the future. Robbins then goes on to display the full extent of his lack of Middle East expertise. Frankly, it is becoming excruciatingly embarrassing to see a succession of so-called BBC experts claiming that Hamas would down arms and disband if only a Palestinian state came into being. The fact that this grossly inaccurate notion is pawned off to BBC audiences as analysis not only shows the lack of competence at work, but also the inability of BBC staff to come to terms with the unpleasant underlying realities of the conflict. Robbins then brings in an expert – Dr Hisham Hellyer – whose decidedly non-academically objective sentiments on the topic are easily identifiable on his Twitter feed. “For now the killing seems unstoppable. Both sides want any eventual ceasefire to look like their victory. And so far, neither side has got what it wants. 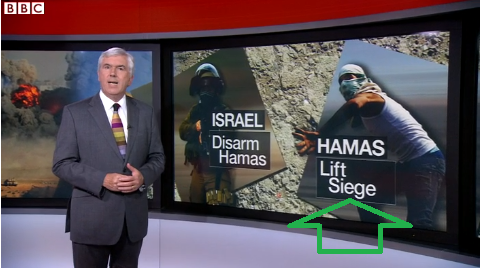 Beyond the glaringly obvious problem presented by the fact that a publicly funded Western media organisation has chosen to embrace, amplify and promote the language of a proscribed terror group, there is clearly another very simple issue at stake with the BBC’s adoption of the term “siege” in relation to the Gaza Strip: it is not accurate. And not only does it not accurately describe the situation, but its use actively prevents BBC audiences from understanding why border restrictions do exist. Remarkably, despite this topic being the subject matter of numerous BBC reports over the past week or so, the BBC apparently thinks it acceptable to fob off audiences with dumbed-down Hamas propaganda rather than to accurately and comprehensively explain the issue. On the afternoon of July 24th an UNRWA school in Beit Hanoun where many Palestinians were sheltering was hit by projectiles of origins as yet unknown. Some sixteen people were killed and many injured. It is not yet clear exactly what happened there and the incident is under investigation by the IDF. What is known, however, is that the vicinity of the school had been previously used by terrorists to fire missiles into Israel, apparently with some falling short. Because of that fact, the IDF had advised UNRWA to evacuate the civilians from that school and a four-hour humanitarian corridor had been agreed. 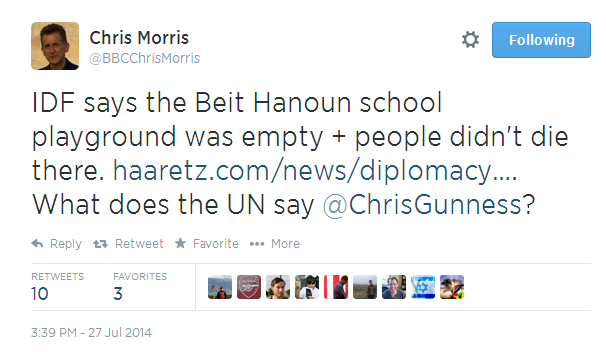 Although UNWRA representatives claimed differently – at least one eyewitness seems to suggest that an evacuation was planned. “The Israeli military warned on Monday that the shelter should be evacuated. By Thursday, the United Nations had decided to withdraw its staff and to stop providing food. It is also known that at the time of the incident, a battle was raging between terrorists and IDF soldiers operating in the area. 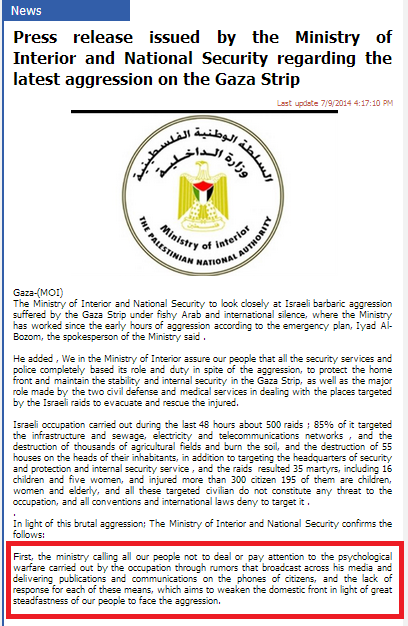 Below is an IDF statement concerning the events. “In the past few days, the area surrounding the UNRWA school in Beit Hanoun has turned into a battlefield, therefore prompting the IDF to insist those present to evacuate it. Furthermore, the IDF authorized a humanitarian time window for evacuation between 10:00-14:00 IDT earlier today. Hamas prevented the civilians from leaving it and once again used their infrastructure and international symbols as human shields. In the course of the afternoon, several rockets launched by Hamas from within the Gaza Strip landed in the Beit Hanoun area. From initial inquiries done about the incident, during the intense fighting in the area, militants opened fire at IDF soldiers from the school area. In order to eliminate the threat posed to their lives, they responded with fire toward the origins of the shooting. The IDF is still reviewing the incident. Beyond Maitlis’ distinctly unprofessional demeanor throughout this interview, her repeated interruptions and her obvious urgency to promote her own version of events to audiences, one patronizing statement she makes is extremely revealing and actually captures the essence of much of the BBC’s reporting of the current hostilities in a nutshell. Whether “strong” is an appropriate adjective for the performance of an interviewer obviously less interested in hearing about the actual circumstances of an event than in promoting her own already fixed – and frankly tediously parochial and uninformed – narrative of events is clearly a matter of taste. 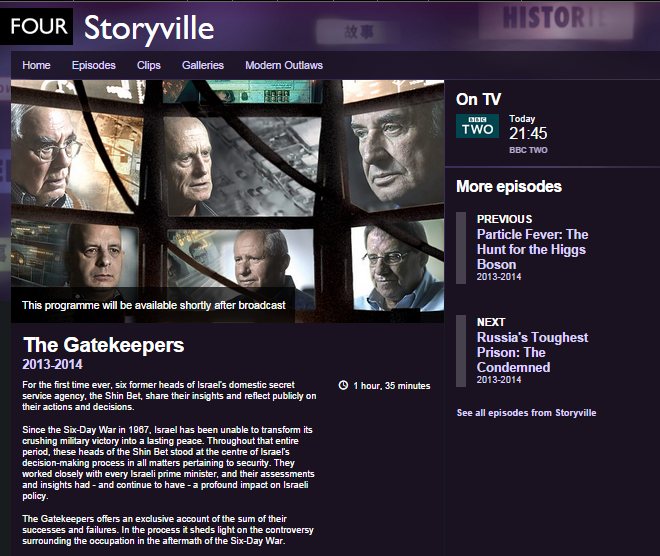 On March 11th 2013, an hour-long documentary entitled “A History of Syria with Dan Snow” was broadcast on BBC Two. An accompanying article under the heading “Syria’s priceless heritage under attack” appeared in the Magazine section of the BBC News website on March 10th. Readers familiar with the history themselves will no doubt have noticed that in Dan Snow’s extensive portrayal of the rich tapestry of ethnic groups making up Syria throughout its history, one particularly ancient community was conspicuous by its absence. No mention whatsoever was made of the centuries-old Jewish community of Syria, either in the television programme or in Snow’s written article which featured the city of Haleb (Aleppo) – home to Jews for millennia and formerly one of the oldest Jewish communities in the world – very prominently. That portrayal of course airbrushes out the persecution of Jews in Syria completely, as well as their subsequent flight from the country. Snow of course fails to inform his audiences that the Golan Heights can only be considered to have been “part of Syria” for a maximum of 45 years before 1967, but it is his one-liner on the subject of the Six Day War which in particular stands out as a blatant breach of BBC Editorial Guidelines on accuracy. Viewers are given no inkling of the events leading up to that war; indeed they might reasonably conclude from Snow’s account that Israelis simply woke up one morning and decided to attack three of the surrounding countries. Snow avoids any mention of the Arab League project to divert the headwaters of the Jordan River (the source of Israel’s main water supply at the time) and the relentless Syrian attacks upon Israeli communities below the Golan Heights during the years preceding the Six Day War. 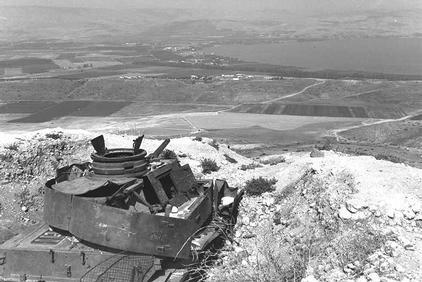 A Syrian tank in its fortified position at “Tawfik”, Golan Heights, dominating Kibbutz Tel Katzir and the Jordan Valley. The closure of the Straits of Tiran on May 22nd 1967 – a clear casus belli, as noted by President Lyndon Johnson at the time – is also ignored by Snow, as are the subsequent almost daily statements put out by Nasser. 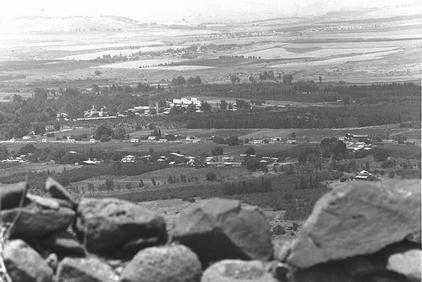 Kibbutz Daphna (foreground) and Kibbutz Dan as seen from the “Tel Azaziat” fortifications, Golan Heights. While Israel did indeed launch pre-emptive strikes on the Egyptian air-force on June 5th 1967, that was of course far from either the beginning or the end of the Six Day War as Snow so erroneously implies. This is far from the first time that the BBC has broadcast or published politically motivated historically revisionist versions of events surrounding the Six Day War. This blog post from CMEW regarding a complaint already made to the BBC about Snow’s above statement suggests, however, that the BBC chooses to remain bunkered in its ahistorical view of those events. It is high time for the BBC to ensure adherence to its own Editorial Guidelines on accuracy and impartiality with regard to this subject and to cease the advancement of political narratives under the guise of “history”. It is the BBC’s self-declared role to contribute to audiences’ knowledge of the world – not to seek to manipulate viewers’ political opinions regarding the Middle East or any other region. Here’s a real tear-jerker of a story from BBC 2 ‘Newsnight‘ reporter Tim Whewell. Entitled “Unusual jobs highlight restricted choices of Gaza youth“, it appeared in the Middle East section of the BBC News website on December 11th. There is also a film version of the report, entitled “Life as a teenager on [sic] the Gaza Strip”, which appeared on the BBC’s flagship news programme ‘Newsnight‘. Unfortunately, Whewell’s selective and stereotypical treatment of the subject matter ensures that his resulting story has all the essential ingredients of a Victorian-era novel. Noble, poverty-stricken young people are unable to pursue their dreams due to being forced into dangerous manual labour in order to support ageing, invalid parents and numerous siblings. In the background is a shady, oppressive, all-powerful entity which controls their lives and shatters their hopes and dreams from afar. One can almost hear Tim Whewell channelling his inner Isabella Banks. In fact, the smuggling tunnels have been in existence since the time of the Oslo Accords, but from the beginning of the second Intifada – i.e. for a good seven years at least before the partial blockade was introduced – they were used to smuggle weapons and terror operatives into the Gaza Strip in addition to drugs and contraband. Rather than the tunnels being a product of the partial blockade, they are actually one of its causes. “In practice, thousands of tons of building materials are transported into Gaza on a regular basis and in accordance with their having been designated for a particular project. Thus we see, for example, that in June 2012 alone, 1,142 truckloads of building materials and 476 truckloads of ceramics and plumbing entered the Gaza Strip. As well as monthly reports, COGAT also issues more detailed weekly reports and so, for example, we can see that in the week September 16th to 22nd 2012, 155 truckloads of aggregates, 27 truckloads of cement, 4 truckloads of iron and 10 truckloads of glass, aluminum and wood profiles entered the Gaza Strip – ie a total of 413 truckloads of construction materials in one week alone. Whewell – conveniently for his emotions-targeted story which goes on to include the abuse of narcotic-like painkillers – makes absolutely no mention in the written version of the use of those same smuggling tunnels to flood the Gaza Strip with military-grade missiles and other weaponry which is later used by terrorist organisations for the purpose of committing the war crime of deliberately targeting Israeli civilians. In the filmed version, a brief throwaway line of narrative says “weapons of course must be smuggled too” and Whewell informs his audience in a derisory tone that “a few rockets from here have hit central Israel”. Neither does he bother to include in his story the aspect of Hamas control over and profit-making from those tunnels or their export functions. Only in the film version is a brief reference made to the fact that goods smuggle through the tunnels are “taxed by Hamas, providing much of the government’s revenue”. The written report fails to include even that brief sliver of information. Instead, Whewell frames the narrative to be absorbed by his audience to include only hapless, poverty-stricken Gazans who have no choice but to operate smuggling tunnels in order to survive the ravages of the completely unexplained – but obviously evil – partial blockade. The decision made by Hamas and other terrorist organisations to turn the Gaza Strip into a launching pad for non-stop terror activities against the civilians of a neighbouring country has no place in Whewell’s narrative because it is one in which Palestinians have no agency and no responsibility for their situation. That same lack of context for the partial blockade continues in his second story, which feature a young woman named Madeline Kullab who works in fishing. Again, sad tales of a beleaguered Gazan fishing industry are told, with only a bizarre and unexplained reference to what Whewell euphemistically terms “gun-running” – as though the problem were a few dusty old carbine rifles. Western journalists often gravitate towards the same people and stories in this region – often guided in the ‘right’ direction by their local fixers. Thus a simple internet search shows that Ms Kullab has been making headlines at least since summer 2010. “La raréfaction des ressources halieutiques, conséquence de la minuscule zone de pêche autorisée, ne lui permet de ramener beaucoup de poissons. Mais pour son père, c’est Hamas qui leur fait le plus de mal. Au début, certains pêcheurs refusaient l’idée qu’une femme puisse être des leurs. Même si quelques uns, des amis de son père, l’ont appuyé comme des frères, d’autres refusaient son choix ou l’enviaient pour son talent. Des rumeurs nausé abondes ont été lancées sur elle. On a dit d’elle qu’elle travaillait avec des hommes n’appartenant pas à sa famille, ce qui est interdit, et pire encore. Elle s’est fait dénoncé auprès des autorités, qui ont commencé à les harceler. Pour son père, le Hamas est un cauchemar quotidien. Insultes, intimidation, mesures coercitives et injustes… Il s’est fait arrêter plusieurs fois, et Madeline a dû négocier avec la police pour qu’il soit libéré. La première fois, un officier leur a dit qu’il avait un document leur interdisait d’accéder au port, à la plage et de partir en mer, tout en refusant de le leur montrer. La deuxième fois qu’ils ont arrêté son père, elle a écrit une lettre demandant sa libération et la restitution de son permis de pêche et de navigation. Elle s’est tournée vers des organisations humanitaires qui sont intervenues auprès du gouvernement, qui a fini par renvoyer l’officier de police concerné. Pour se venger, la police continue à les harceler. Elle peut maintenant partir pêcher du port de Gaza, mais pas des plages au nord de Gaza, contrôlées par la police. Mais elle a retrouvé sa licence de pêche. It seems, however, that the story of Hamas’ harassment of Ms Kullab and her father did not interest the BBC’s Tim Whewell very much. Like Hamas terrorism and Hamas weapons smuggling, that story just does not fit into the narrative he is trying to advance to his audience. The promotion of specific politically-inspired narratives through the blatantly selective use of information and the advancement of stereotypes can never meet the standards required of the BBC on accuracy and impartiality and that should clearly be a cause for concern to Tim Whewell’s editors. But no less disturbing to them should be the fact that a campaigning organization such as the ISM – the whole raison d’etre of which is to discredit, defame and destroy Israel – is capable of being more open and honest about Hamas oppression of women than the BBC.